Espresso Balsamic Vinegar, The Filling Station, Manhattan | Parlez-Vous Loco? You know what’s great about New York? You can find absolutely anything–and I do mean ANYTHING. Like a store with forty or fifty kinds of salt, just laid out beautifully before you on sampling plates, waiting for you to scoop a little up and try it. Sure, you can find samples of exotic salts in other places in other cities, but do those other places also have forty or fifty kinds of olive oil along with forty or fifty infused vinegars? With little cardboard cups that allow you to sample as many as you want? 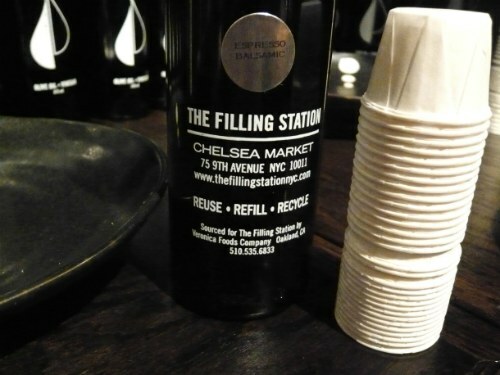 Welcome to The Filling Station in Chelsea Market, a place where you can while away a good chunk of time trying the aforementioned flavored salts and infused olive oils and vinegars in flavors that you probably never thought existed. Like espresso balsamic, which I became mildly obsessed with one day, going back four or five times to fill up my little cup to make sure it was good as I thought it was. (It was.) I left that day without any. I guess espresso vinegar just seemed a little, I don’t know, indulgent and slightly ridiculous for a person who wants to save money, but welcome to the inside of my brain, where the logic is flawed and the internal powers of persuasion are strong. Which is to say, I finally bought a bottle. And you know what? My life really is so much better with this vinegar in it. The Filling Station recommends using it in reduction sauces for red meat. Great idea, but I WILL NEVER DO THAT. What I did do was pour it over strawberries–amazing. And vanilla ice cream–also amazing. (And I hate using the “A” word in general, but for vinegar, it really is pretty damn amazing.) Sometimes when I want something sweet or something savory (it’s a little of both) but I don’t want the calories (being a woman is so hard), I go to my refrigerator and have a couple of spoonfuls of this. Which is a little batshit crazy to admit, I know, but there it is: I EAT VINEGAR BY THE SPOONFUL. Take me or leave me, world. The Filling Station gives you a 10 percent discount on your next purchase if you bring back clean bottles and refill those, rather than buying new ones. Oh, and they apparently have craft beer too, which I (shockingly) never saw. I must’ve been drunk on some fig vinegar. Sometimes you just need to say WTF and indulge. If your life is better because you spent a little more of your hard earned cash on some fancy vinegar then I say DO IT! And I know you know why…because life is just too damn short and even though you actually could take that vinegar with you to the grave you can’t eat it after your buried and they’d be all made because you didn’t re-use or recycle the bottle! Thought for the day…would drizzling some on pizza be too much? Love you RB!